By Karrar Haider in Desktop. Updated on November 26, 2017 . One of the most common Windows problems is that your PC becomes sluggish after you leave it idle for a while. If that’s the case then most probably Automatic Maintenance is to be blamed. If a system stays idle for approximately 5 minutes and it does this on daily basis, then Windows automatically runs the maintenance tool in the background. Worst of all, there are no options to disable this feature in Windows 8 and 10. I find daily Windows Automatic Maintenance to be a bit too frequent and meddling. That is why I keep it disabled and enable it when I got nothing to do and I can safely maintain my PC. If you want to do this too, then this post can be of real help as I’ll show you how you can disable Windows Automatic Maintenance in Windows 8 and 10. Let’s get started. It’s essential for you to know what Automatic Maintenance actually does before you disable it. Automatic Maintenance basically runs multiple types of scans to check for security, performance, and update issues and fix them. For example, it will check for virus definition, defrag disks, and check for Windows and app updates, etc. This scan is important for optimized Windows experience, but if it causes problems for your PC then you can disable it. Although I will still recommend you to occasionally enable Automatic Maintenance and let it run to get the best experience. Your PC will become slow when the scan will run. Automatic Maintenance uses loads of CPU resources and you may find system resources lacking for your other tasks. However, if you have a high-end PC, you may not notice this. It’ll automatically wake up your PC when the maintenance schedule kicks in. This could possibly keep your PC up while you’re away and use unnecessary power. If this is your problem, then there’s no need to disable Automatic Maintenance. Just type automatic maintenance in the search and you’ll find the option to stop it from waking up the PC. If there is a problem with one of the maintenance tasks, then it could lead to PC crashes and blue screen of death. This is rather rare, but some users have reported this happening after they leave their PC idle. If there is a particular feature that you don’t want to use but Windows thinks it’s important for you, then it will throw a notification after every maintenance. This can be really annoying and will bug on daily basis. If you are running multiple instances of Windows in a virtual machine, then the maintenance can start running in all of the virtual machines simultaneously. This could really slow down the system or even crash it. Windows 8 and 10 both don’t allow you to disable Automatic Maintenance, therefore, we have to do some registry hacking. 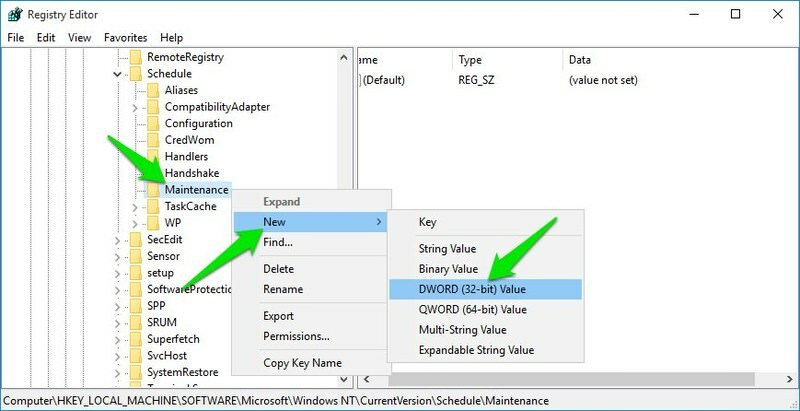 A simple windows registry key is all you need to manage Automatic Maintenance. Warning: Make sure you backup the registry before following these instructions. Any unintentional changes in the registry could corrupt your system and possibly lead to data loss. Press Windows + R keys and type regedit in the Run dialog to open Windows registry. A new entry will be created in the right panel. Name this entry MaintenanceDisabled same as it is written here. Next double-click the entry to modify it and enter 1 as its value. This will enable this entry, therefore disable maintenance. A PC restart is required for the changes to take effect. To re-enable Automatic Maintenance, just modify the same entry again and add 0 as its value. Tip: As I frequently enable/disable Window Automatic Maintenance, I have added the registry location to my favorites for quick access. If you want to do the same, then click on the Favorites button at the top in the registry and add the location to favorites. Disabling Automatic Maintenance isn’t necessary and you should not do it unless you face any problems. Although it does create problems for users with older PCs or people who like more control over what and when a process may run on their system. Do let us know in the comments why you wanted to disable Automatic Maintenance.